I'm loving this wonderful book. It's the first Jill Dupleix book on my shelf and definitely won't be the last. I've flagged so many recipes to try. The Chili-lime wings on p. 60 are outstanding. The wings marinate overnight in a chili-lime, garlic mixture before hitting the grill. They are served w a fabulous Chili-lime sauce drizzled over top. These flavours appeal to us in any event but I have to say, these were simply the best chicken wings we’ve ever had . . . so flavourful with a wonderful tangy heat from the sauce. Really, really yummy. Finger licking good. Chilli lime sauce is gorgeous! Made the mistake of adding lime juice & fish sauce at the beginning rather than at the end, BUT still gorgeous. p. 60 These are not only the best chicken wings I’ve ever made, they’re the best (non-Buffalo-style) chicken wings we’ve ever eaten! Honest! Given that the recipe comes from the same genius that brought us the much-adored Crash Hot Potatoes, I’m not at all surprised. The only change I made was to add lime zest to the marinade and the sauce and to omit the cilantro due to an allergy. We grilled these over charcoal and went out the next day to buy more wings so we could have them again. This is a must-try dish that we’ve enjoyed on repeated occasions. p. 67 - This is a quick and delicious spread made w pantry ingredients. Perfect for those times when you have unexpected guests. Anchovies are mashed w their oil, capers, parsley and pepper then the mixture is spread atop bread which is broiled then cut into fingers prior to serving. Surprisingly the anchovy flavour doesn't overwhelm and the saltiness makes this a great little bite to serve w cocktails or wine. I did like this even more w a spritz of lemon over top. Definitely worth repeating. mr bc made this which makes it even better!! 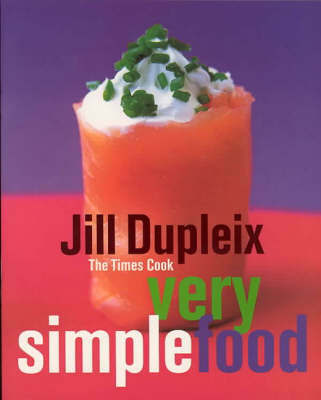 As a sequel to "Simple Food", Jill has created another collection of recipes that are even simpler. This cookbook aims to reflect modern ways of shopping and eating. The varied collection of recipes includes ideas for all occasions - lunches, dinners, family meals, special occasions, and easy desserts. With simple dishes including salmon egg tarts, jump-in-the-pan chicken, and pineapple sushi, this book has been written for those who have a passion for good food and very little time to cook.